Mother Catresa's Chronicle: Hoo-Hoo-Hoo-Hooooo, Whiteout! We now return to KITT-FM, where it's all kittens, all the time. And now, broadcasting live from our studios in Purrbank, Cat-i-fornia, heeeeeeere's your hostess, Mother Catresa! Punxsutawney Phil, the Pennsylvania groundhog who makes his prediction about the end of winter on Feb. 2, has spoken: it's several more weeks of winter for us. But I protest on grammatical grounds: you can't have six MORE weeks of winter when you didn't have much winter to begin with. It's been a bummer of a winter here in Pittsburgh: often cold, but way too springy, too early, and only two mild snowstorms. So much for that "In the meadow, we can build a snowman" lyric from that Christmas carol! The deficient supply of the white powder, perhaps, makes the start of Mother Catresa's 2012 all the more appealing: I got a white cat to foster, and another one is coming to my house this week! 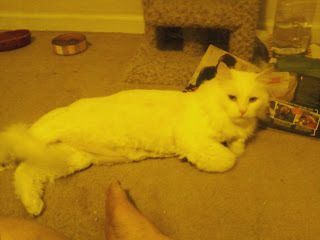 Snowball, as we named him, looks to be a purebred Angora. See the picture: Isn't he a beauty? His hair is long and silky, and pure white. Pure as the driven snow, so to speak (and I'm going by memory here, hehe.) He is very sweet so he definitely was someone's pet, although the calloused assclown turned him loose. A kind woman in the south Pittsburgh suburbs found the terrified kitty wandering through her neighborhood, took him in, and called us (Foster Cat, Inc.) for a permanent solution. I picked him up a few weeks ago, and he spent most of his time hiding under my guest room bed - which, incidentally, has black bedding. The poor guy's coat, undoubtedly beautiful when cared for, was covered in mats - he looked like a shredded wad of cotton. Last week, I took him to a professional groomer to get him a "lion cut" - where they shave the cat's body, leaving just a mane and at least part of the tail. That's why he looks a bit funny, but frankly, I think he looks stunning even with his hairdo - er, hair-don't. Just wait until that coat grows back and he has an owner who actually cares for him! Snowball now awaits adoption at the Petsmart in Cranberry Township. I had him for such a short time, but I hated saying goodbye to him. When he came out from under the bed, he was such a lovebug. He would sit high up on my chest, practically throwing himself against my throat. I almost got a few mouthfuls of messy white fur! I love white cats. In fact, as a kid, I had two of them. Burt was the original, and Smudge - a white kitten, except for an Ash Wednesday-like smudge of gray on her forehead - came in high school. There's something about the non-color color white: It's a symbol of purity, innocence and beauty. A white cat, to me, looks sweet and radiant, like a ray of white light. And it reminds me of my very first kitty cats, those I had as a child. And now, perhaps to lessen the blow of the crappy winter, a shorthaired white female named Bella is coming to my house. Yeah, another mighty whitey! She is at a vet's office now, after someone found her wandering and gave us a call. My black sheets and comforter will be covered with conspicuous white fur, and so will my black sweat pants and t-shirts. But, I have the opposite issue with my black cat Gormly Girl (G.G. ): She gets her black fur all over my light clothes. But as we animal lovers know, no outfit or bed is complete without a little bit of cat hair. P.S. Yes, that is my unpedicured foot sticking out in the picture. Don't laugh.